Objective To identify, critically appraise and summarise existing systematic reviews on the impact of global cardiovascular risk assessment in the primary prevention of cardiovascular disease (CVD) in adults. Design Systematic review of systematic reviews published between January 2005 and October 2016 in The Cochrane Library, EMBASE, MEDLINE or CINAHL databases, and post hoc analysis of primary trials. Participants, interventions, outcomes Systematic reviews of interventions involving global cardiovascular risk assessment relative to no formal risk assessment in adults with no history of CVD. The primary outcomes of interest were CVD-related morbidity and mortality and all-cause mortality; secondary outcomes were systolic blood pressure (SBP), cholesterol and smoking. 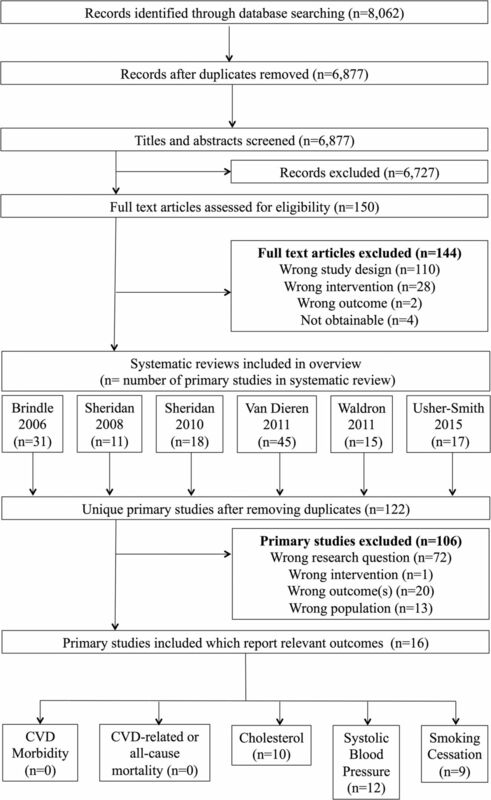 Results We identified six systematic reviews of variable but generally of low quality (mean Assessing the Methodological Quality of Systematic Reviews 4.2/11, range 0/11 to 7/11). No studies identified by the systematic reviews reported CVD-related morbidity or mortality or all-cause mortality. Meta-analysis of reported randomised controlled trials (RCTs) showed small reductions in SBP (mean difference (MD) −2.22 mm Hg (95% CI −3.49 to −0.95); I2=66%; n=9; GRADE: very low), total cholesterol (MD −0.11 mmol/L (95% CI −0.20 to −0.02); I2=72%; n=5; GRADE: very low), low-density lipoprotein cholesterol (MD −0.15 mmol/L (95% CI −0.26 to −0.05), I2=47%; n=4; GRADE: very low) and smoking cessation (RR 1.62 (95% CI 1.08 to 2.43); I2=17%; n=7; GRADE: low). The median follow-up time of reported RCTs was 12 months (range 2–36 months). Conclusions The quality of existing systematic reviews was generally poor and there is currently no evidence reported in these reviews that the prospective use of global cardiovascular risk assessment translates to reductions in CVD morbidity or mortality. There are reductions in SBP, cholesterol and smoking but they may not be clinically significant given their small effect size and short duration. Resources need to be directed to conduct high-quality systematic reviews focusing on hard patient outcomes, and likely further primary RCTs. This systematic review summarises evidence from six systematic reviews on the use of global cardiovascular disease (CVD) risk assessment for the primary prevention of CVD in adults and reports important patient outcomes. The quality of the systematic reviews was assessed using Assessing the Methodological Quality of Systematic Reviews and was generally poor, with inconsistencies in methods, outcomes, quality appraisal and reporting. Owing to the deficiencies in the reviews, we undertook post meta-analyses, which included further analysis of the identified primary studies within the reviews and quality appraisal using GRADE. Our systematic review was strengthened by its broad inclusion criteria, which reduced the chance we missed relevant systematic reviews. The findings of our post hoc meta-analyses should be interpreted with caution given the paucity of evidence and low to very low GRADE scores. Cardiovascular disease (CVD) is the leading cause of death worldwide.1 Contrary to popular belief, death and disability from CVD is also a major burden in low-resource settings2 ,3 and despite impressive global reductions in mortality over the last two decades, years-of-life-lost due to CVD is rising in low-income and middle-income countries.4 Prevention is therefore a worldwide priority. Even with an abundance of clinical guidance and effective interventions targeting modifiable risk factors, the majority of patients at risk do not achieve sufficient risk factor control.9–14 In jurisdictions where risk scoring is part of routine clinical practice, this may be due to implementation challenges, such as physician attitudes to and understanding of CVD risk assessment,14–16 challenges communicating risk to patients and patients' understanding of risk17 ,18 or lack of a true effect. Although calibration and discrimination studies of prognostic risk score models are important, trials on the prospective use of risk scores in practice are required to determine their impact on patient outcomes. We prospectively registered our protocol on PROSPERO (registration CRD42015019821),24 and deviations from this plan, which were minor, are described in online supplementary S1 appendix 1. We searched the Cochrane Library, EMBASE, MEDLINE and CINAHL databases from January 2005 to October 2016 (see online supplementary S2 appendix 2 for detailed search strategies). We searched from 2005 because we felt that more recent systematic reviews were likely to capture the same primary studies as older systematic reviews. No language restrictions were applied. Search strategies used a mix of Medical Subject Heading (MeSH) terms and keywords and were developed with an information specialist. We supplemented this strategy by handsearching the bibliographies of included reviews, forward citation searching on Google Scholar and Web of Science and by contacting experts. We included systematic reviews of studies of any design that included adults (18 years of age or older) with no history of CVD (including atrial fibrillation). Reviews were eligible for inclusion if they considered interventions involving global CVD risk assessment relative to no risk assessment, irrespective of who performed the risk assessment, how it was performed and to whom the information was directed. We excluded studies of perioperative CVD risk scores, analogue patients, patients with existing CVD, validation studies and accuracy studies of CVD risk scores. Study selection, data extraction and quality assessment was done in two phases. We first screened systematic reviews for inclusion, and then screened primary studies reported in the systematic reviews as required. Two reviewers screened titles and abstracts for full text review and disagreement was resolved by consensus. We screened full text articles for inclusion using the same method. Two reviewers independently extracted salient characteristics about the included reviews and their description of included studies, including the classification of interventions as either directed toward the patient, provider or the patient and provider. The same reviewers independently assessed methodological quality using the Assessing the Methodological Quality of Systematic Reviews (AMSTAR) checklist.27 We documented the method of quality assessment and extracted the quality of primary studies as reported by the review authors. If a primary study was reported by more than one review, we extracted the quality score from the review with the highest AMSTAR rating. We did not initially plan to extract data from primary studies; however, to address poor or insufficient reporting, or to verify intervention classifications, the second phase involved the same two reviewers extracting additional data from the primary studies as needed. We extracted data from primary studies as reported in systematic reviews and tabulated all results by outcome using Microsoft Excel 2010 and Microsoft Word 2010. In the event of a discrepancy, we used the data reported in the primary study rather than the systematic review. When outcomes were reported at multiple time points in a single study, we selected the longest follow-up time with complete data. We narratively reported systematic reviews and tabulated their salient characteristics, including review, author conclusions and AMSTAR ratings. For our post hoc analysis of primary studies reported by systematic reviews, we used RevMan V.5.3 to construct forest plots and inverse variance-weighted random effects meta-analyses.28 One author entered data into RevMan and these were independently verified by a second author. We only included randomised studies in meta-analyses; other study designs or randomised studies with insufficient data to meta-analyse were reported narratively. For continuous outcomes, we calculated mean differences and for dichotomous outcomes, risk ratios. We performed subgroup analyses by the intended target of the intervention (patient, provider or both). We imputed standard error (SE) when reasonable, using the average SE of studies reporting the same outcome and in the same subgroup, and in such cases a sensitivity analysis was performed. For each outcome meta-analysed, we used the GRADE methodology to rate the quality of evidence using GRADEpro GDT software.29 ,30 This was done by one author and checked by a second; disagreements were resolved by consensus. We used I2 values to estimate statistical heterogeneity. We screened 6877 studies for inclusion, 6727 of which were excluded as irrelevant based on title and abstract (figure 1). Following full-text review of 150 studies, six systematic reviews met the inclusion criteria. We excluded 144 articles, the majority (n=110) due to the study design. The six included systematic reviews together reported 122 unique primary studies, 16 of which were relevant based on our inclusion criteria, including adults with no history of CVD and global CVD risk assessment as an intervention relative to no risk assessment. Of these, none reported CVD-related morbidity or mortality or all-cause mortality, 12 reported SBP, 10 reported cholesterol and 9 reported smoking cessation (figure 1). Flow diagram of included systematic reviews, primary studies and the outcomes reported. Characteristics of included systematic reviews are summarised in table 1. Reviews were generally broad in scope, published from 2006 to 2015, considered all study designs and collectively searched 11 databases. AMSTAR ratings ranged from 0/11 to 7/11 (mean 4.2/11); we did not exclude any reviews based on quality (see online supplementary S3 appendix 3). The conclusions of reviews were consistently of general uncertainty about the impact of cardiovascular risk assessment on hard patient outcomes. Brindle et al31 (AMSTAR 4/11) sought to determine the accuracy and impact of CVD risk assessment. To assess impact, they considered randomised controlled trials (RCTs) of healthcare professionals using a CVD risk score to aid in primary prevention, relative to usual care, in populations predominantly free from symptomatic CVD (table 1). Although the authors identified 31 primary studies, the majority of the studies assessed the accuracy of CVD risk assessment and therefore were beyond the scope of our review. The authors concluded that there was little evidence to support the use of risk scores for primary prevention. Sheridan et al33 (AMSTAR 7/11) was distinct from Sheridan 2008 in that eligible interventions were targeted at patients rather than physicians. To be eligible, studies (of any design) had to be interventions of global CVD risk information, solely or as part of a complex intervention, directed at adults with no history of CVD to determine the impact of patient-targeted risk information on patient outcomes (table 1). In this review, Sheridan et al searched multiple databases and identified 18 primary studies; most were relevant to our review. They concluded that the effect of risk information on patients may improve proximal outcomes, such as accuracy or risk perception, in those who are high risk but the effect on distal outcomes was not clear. Waldron et al34 (AMSTAR 5/11) reviewed studies of any quantitative design that used communication interventions for individualised cardiovascular risk and compared them to a control or usual care and assessed their impact on patient-related outcomes (table 1). Although the authors performed a comprehensive search, only three of the 15 primary studies identified were in actual patients—the rest were of analogue patients and therefore were not relevant to our review. The authors were unable to draw strong conclusions citing the need for better quality trials. Usher-Smith et al36 (AMSTAR 5/11) conducted the most recent and most comprehensive review, although the searches were conducted in 2013. The authors considered randomised or non-randomised studies of interventions consisting of the provision of a CVD risk estimate to patients, or their providers, in patients with no history of CVD (table 1). Searching MEDLINE and PubMED, they identified 17 primary studies, the vast majority of which had previously been reported by one of the aforementioned systematic reviews. However, this review was the first and only review to conduct meta-analyses, which helped draw stronger conclusions about impact. The authors concluded that global risk assessment could improve prescribing and perceived risk, but not smoking, and their meta-analyses showed no significant effect on SBP or pooled total cholesterol and low-density lipoprotein (LDL) cholesterol. As the included reviews were of variable, but generally low quality and only one attempted meta-analysis, we conducted a post hoc analysis of the primary studies reported by included systematic reviews that met our inclusion criteria to gain further insight from the reported data. Furthermore, some of the reviews insufficiently described included primary studies. Therefore, in addition to meta-analysis, we tabulated the characteristics of included primary studies, including quality ratings for each study as reported by review authors, which are included in online S4 supplementary appendix 4. The median follow-up of all included primary studies reported by reviews was 12 months, but ranged from 2 to 36 months (see online supplementary S4 appendix 4). Most interventions used Framingham or a Framingham-derived risk score; these interventions and their controls are summarised in detail in online supplementary S4 appendix 4. None of the systematic reviews used GRADE to evaluate the quality of studies, and we therefore included GRADE tables for each outcome and subgroup in online supplementary S5 appendix 5. No reviews included studies reporting CVD-related or all-cause mortality (table 2). No reviews included studies reporting CVD-morbidity (table 2). Five reviews reported a total of 12 unique primary studies (n=23 346) (see online supplementary S4 appendix 4). Of the 12 primary studies, 3 were cluster RCTs, 8 were RCTs and 1 was an observational follow-up of an RCT. Nine of the controlled trials (n=7537) were reported with sufficient data to meta-analyse, resulting in a mean difference of mean change of SBP of −2.22 mm Hg (95% CI −3.49 to −0.95; I2=66%; GRADE: very low) (figure 2; table 2). Subgroup analyses by studies of interventions targeting the patient (n=3), provider (n=3) or both (n=3), resulted in mean differences of −4.88 mm Hg (95% CI −8.57 to −1.19; I2=0%; GRADE: very low), −1.14 mm Hg (95% CI −2.09 to −0.19; I2=46%; GRADE: low) and −2.77 mm Hg (95% CI −5.91 to 0.37; I2=76%; GRADE: very low), respectively, in the intervention group relative to control (figure 2; table 2). We imputed the SE of Lovibond (1986); excluding this study from the meta-analysis did not significantly change the results of the subgroup analysis or overall estimate: −4.82 mm Hg (95% CI −9.36 to −0.27; I2=0%) and −2.12 mm Hg (95% CI −3.41 to −0.83; I2=68%), respectively. Forest plot and meta-analysis of the mean difference of mean change in systolic blood pressure (mm Hg) from baseline to follow-up between intervention and control groups. Two additional patient-directed studies were identified. The first, an RCT,37 evaluated the impact of health checks which comprised a Framingham-derived risk score and counselling about risk, relative to usual care, in middle-aged adults. The study found a difference in SBP of −2.5 mm Hg (95% CI −3.7 to −1.3) between the intervention and control group after 3 years; however, this was not adjusted to baseline values.33 The second, an observational follow-up of an RCT,38 found no significant difference between patients who received their risk score along with a decision analysis tool, relative to usual care, after 3 years: adjusted difference of SBP between intervention and control at follow-up was 0.94 mm Hg (95% CI −3.2 to 5.1, p value 0.65). Six reviews reported a total of nine RCTs and one cluster RCT (see online supplementary S4 appendix 4). We considered total cholesterol and LDL cholesterol, and analysed them separately. Of the seven trials (n=23 406) reporting total cholesterol, five (n=7813) were reported with sufficient data to meta-analyse, resulting in a mean difference of −0.11 mmol/L (95% CI −0.20, −0.02; I2=72%; GRADE: very low) (figure 3; table 2). Subgroup analyses by studies of interventions targeting the patient (n=2), provider (n=1) or both (n=2), resulted in mean differences of −0.07 mmol/L (95% CI −0.13,−0.02; I2=0%; GRADE: very low), −0.01 mmol/L (95% CI −0.08 to 0.06; GRADE: very low) and −0.26 mmol/L (95% CI −0.38 to −0.15; I2=0%; GRADE: very low) (figure 3; table 2). 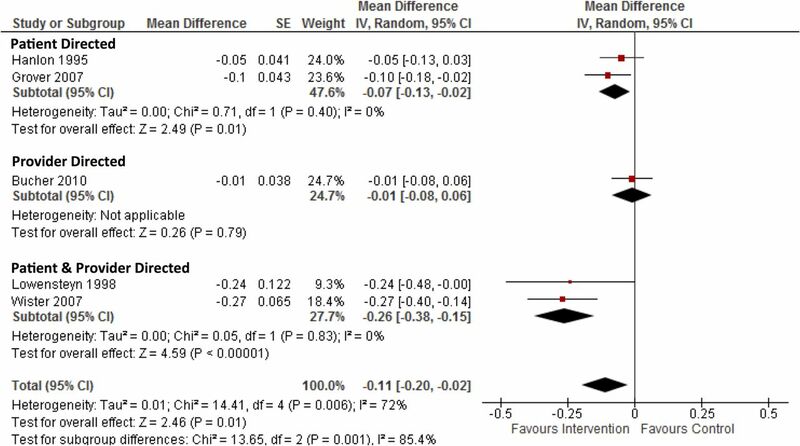 Forest plot and meta-analysis of the mean difference of mean change in total cholesterol (mmol/L) from baseline to follow-up between intervention and control group. Five trials (n=4940) reported data on LDL cholesterol, four of which (n=4505) when meta-analysed yielded a greater reduction in LDL cholesterol in the intervention group compared with the control group: mean difference of −0.15 mmol/L (95% CI −0.26 to −0.05, I2=47%; GRADE: very low) (figure 4; table 2). Subgroup analyses by studies of interventions targeting the patient (n=3) and the patient and provider (n=1), resulted in mean differences of −0.15 mmol/L (95% CI −0.27 to −0.03; I2=58%; GRADE: very low) and −0.23 mmol/L (95% CI −0.47 to 0.01; GRADE: very low), respectively (figure 4; table 2). Forest plot and meta-analysis of the mean difference of mean change in LDL cholesterol (mmol/L) from baseline to follow-up between intervention and control group. LDL, low-density lipoprotein. Three reviews reported a total of eight RCTs and one cluster RCT and (n=19 873) (see online supplementary S4 appendix 4). Seven of these trials (n=4131) were reported with sufficient data to meta-analyse, resulting in a risk ratio for quitting smoking of 1.62 (95% CI 1.08 to 2.43; I2=17%; GRADE: low) (figure 5; table 2). Subgroup analyses by studies of interventions targeting the patient (n=4), provider (n=2) or patient and provider (n=1) resulted in risk ratios of 1.53 (95% CI 1.07 to 2.19; I2=0%; GRADE: low), 1.90 (95% CI 0.43 to 8.29; I2=57%; GRADE: very low) and 0.30 (95% CI 0.01 to 7.07; GRADE: moderate), respectively (figure 5; table 2). 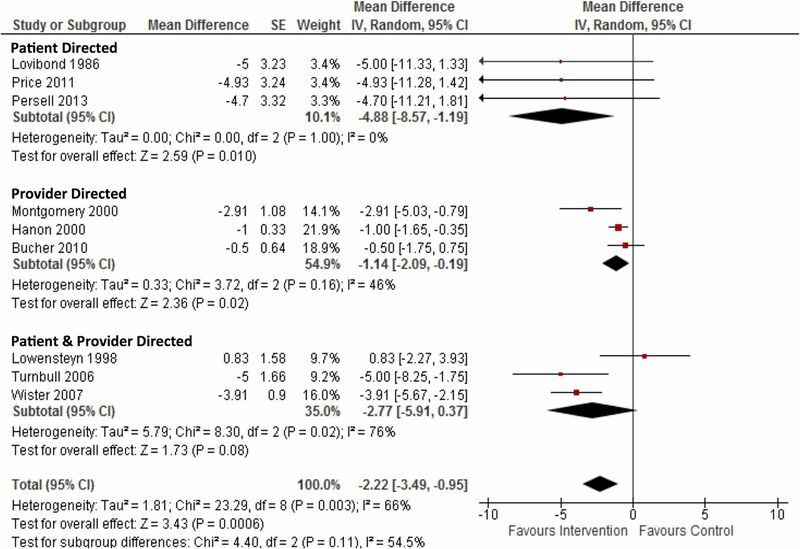 Forest plot and meta-analysis of the risk ratio of quitting smoking from baseline to follow-up between intervention and control group. To the best of our knowledge, this is the first systematic review of systematic reviews on the impact of global cardiovascular risk assessment in the primary prevention of CVD. Reviews on this topic vary in the databases searched, search strategies used and the specific populations and interventions of interest, and their quality was generally poor (mean AMSTAR 4.2/11, range 0/11 to 7/11). However, they have consistently reported uncertainty about the effectiveness of global CVD risk assessment. Our results show that to date, no reviews or their included primary studies have reported CVD-related morbidity or mortality or all-cause mortality. Post hoc analysis of data reported by included reviews illustrated very low-quality evidence for small reductions in SBP, total cholesterol, LDL cholesterol and low-quality evidence for small increases in smoking cessation. We conducted a post hoc analysis of data reported by included systematic reviews to compensate for the poor evidence synthesis of some of the included reviews and to reduce research waste. Several of the included reviews highlighted a need for better quality trials on this topic, and our quality appraisal using GRADE corroborates these conclusions. Our post hoc analysis illustrated that all effect estimates were of low GRADE or very low GRADE quality. 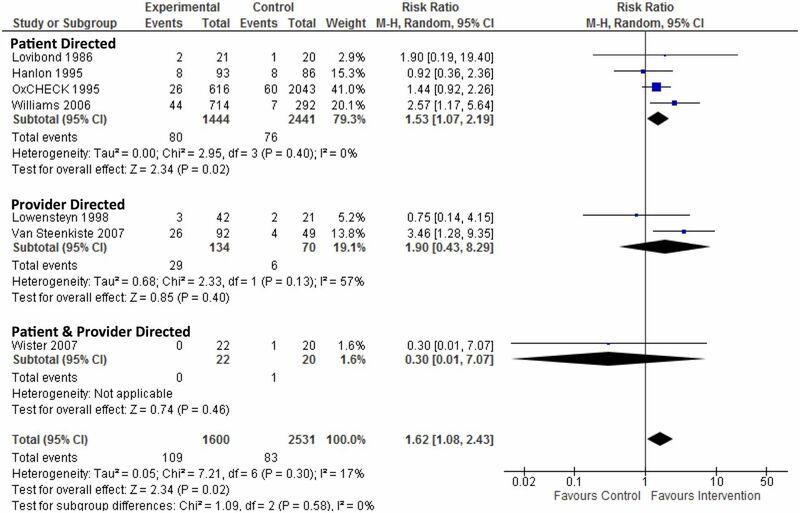 Our meta-analyses of data reported by systematic reviews, although not the primary aim of our systematic review, advances our knowledge on the impact of total cardiovascular risk assessment beyond what was reported by individual systematic reviews. Given the disparate and poor quality of data reporting and quality appraisal of the included systematic reviews, we felt it was responsible to perform better quality evidence synthesis and quality appraisal. Reductions in SBP, LDL cholesterol and smoking tended to be greatest when cardiovascular risk information was directed at patients. The delineation between patient-directed and provider-directed interventions is not well resolved, since patients may discuss risk information with their provider and vice versa. This phenomenon may contaminate the subgroup analysis. A previous review33 concluded that greater effects were seen in patients with increased baseline CVD risk; adjusting for baseline CVD risk in our analyses did not explain the observed trend toward patient-directed interventions. Observed reductions in blood pressure, cholesterol and smoking could lead to reductions in overall risk and eventual reduction in CVD events. For this to be true, such changes must be sustained long term to have a meaningful impact on event rates in individual patients. However, the median follow-up of all eligible studies reported by included systematic reviews was only 12 months. Therefore, we can have little confidence from the systematic review literature in the prospective use of CVD risk scores translating into long-term clinical benefits. There is evidence, from studies retrospectively risk scoring patients, that the absolute reduction in CVD events from cholesterol-lowering and blood pressure-lowering treatment is associated with baseline CVD risk.45 ,46 It is important to distinguish, however, that these data do not illustrate that the prospective use of global CVD risk assessment improves patient outcomes, but suggest that targeting high-risk patients is an efficient way to allocate resources to reduce CVD events. Nor do studies of calibration and discrimination imply effectiveness. Our systematic review of systematic reviews was strengthened by its broad inclusion criteria, which reduced the chance we missed relevant literature and allowed us to include reviews whose primary objective may not have been assessing the impact of risk assessment. This method provides quality appraised systematic reviews and their primary studies and therefore can help inform policy and practice, in addition to providing new insight from rigorous data synthesis from a breadth of sources. It also highlights trends in the systematic review literature. While there was heterogeneity in the risk scores used, the exact nature of the interventions, comparisons, follow-up time and patient demographics, we feel that such heterogeneity approximates the reality of clinical practice. The results therefore provide a good approximation of impact. While we believe we have taken steps to ensure an exhaustive search, it is possible some systematic reviews were missed. Our post hoc analysis of primary studies reported by included systematic review should be interpreted with caution. Its purpose is to better appraise and synthesise the primary studies which are already available in the systematic review literature, and therefore it does not represent the conclusions from a systematic review of individual primary studies, and it is possible that further primary studies exist. Given that these data were not appraised and synthesised to a high standard in the included systematic reviews, we felt it necessary to do so. There are likely further primary studies that can add to our meta-analysis, and high-quality systematic reviews should be conducted and these analyses should be updated. We were unable to perform sensitivity analyses due to a paucity of data. We did not contact authors of primary studies, which may have allowed us to adjust unadjusted study results which we were forced to report narratively. However, as these studies were reported in systematic reviews, some of which contacted study authors, we believe the likelihood of further data becoming available to be minimal, and the findings of these studies did not contradict our overall findings of the meta-analyses. In addition, we did not assess publication bias and reporting bias, not least because of the paucity of evidence, which may lead to overestimations of the effective sizes. We imputed the SE of one study,48 which may underestimate heterogeneity; however sensitivity analysis revealed only a 2% absolute increase in I2 for the overall effect estimate when this study was excluded. The current evidence base is limited in that all patients were from high-income countries, many were hypertensive and most interventions used a Framingham-derived risk score. The findings of our post hoc meta-analyses should be interpreted for practice with caution given the paucity of evidence and its low quality. Policymakers worldwide should take care when implementing global cardiovascular risk approaches, especially in an era where prevention efforts are expanding worldwide, as there was no systematic review evidence to suggest that the prospective use of global cardiovascular risk assessment in clinical practice reduces CVD events. Although the most recent systematic review was published in 2015, its literature search was conducted in 2013. Researchers should therefore update and improve the quality of systematic reviews and focus on CVD-related morbidity and mortality and other hard patient outcomes. In some jurisdictions, such as many low-income and middle-income countries, high-quality primary studies may be needed and these should be done before the widespread implementation of CVD risk scoring or, if not possible, in concert. There is currently no evidence from systematic reviews that the prospective use of global cardiovascular risk assessment translates to reductions in CVD events. Systematic reviews, which were generally of poor quality, have consistently reported uncertainty about the impact of this practice on meaningful patient outcomes. These reviews found no studies reporting CVD-related morbidity or mortality, and the reductions in SBP, cholesterol and smoking may not be clinically significant given their small effect size and short duration. Despite the widespread popularity of global cardiovascular risk assessment, resources need to be directed in the first instance to conduct high-quality systematic reviews, and further RCTs powered to measure CVD-related morbidity and mortality may be needed. World Health Organization. Cardiovascular diseases (CVDs). 2015. http://www.who.int/mediacentre/factsheets/fs317/en/ (accessed 4 Aug 2015). WHO. Package of essential noncommunicable (PEN) disease interventions for primary health care in low-resource settings. Geneva, Switzerland. 2010. http://apps.who.int/iris/handle/10665/44260 (accessed 27 Oct 2014).
. Global cardiovascular risk assessment in the primary prevention of cardiovascular diseases in adults: an overview of systematic reviews. PROSPERO Int. Prospect. Regist. Syst. Rev. 2015. http://www.crd.york.ac.uk/PROSPERO/display_record.asp?ID=CRD42015019821 (accessed 4 Aug 2015).
. Clinical guidelines and evidence review for lipid modification: cardiovascular risk assessment and the primary and secondary prevention of cardiovascular disease. London: National Collaborating Centre for Primary Care and Royal College of General Practitioners 2008;1–241. GRADEpro GDT. GRADEpro Guideline Development Tool. 2015. http://www.gradepro.org.
. Three-year follow-up of a factorial randomised controlled trial of two decision aids for newly diagnosed hypertensive patients. Br J Gen Pract 2005;55:551–3. ▸ Additional material is available. To view please visit the journal online (http://dx.doi.org/10.1136/bmjopen-2016-013650). Contributors DRJC conceived of the study, screened articles, extracted data, analysed the data and wrote the manuscript. ACT screened articles, extracted data, contributed to analysis and manuscript writing. IJO contributed to GRADE appraisal, analysis and manuscript writing. NR reviewed and contributed to the database search strategies. AMW contributed to the analysis and manuscript writing. CJH contributed to the methodological approach, the analysis and manuscript writing.